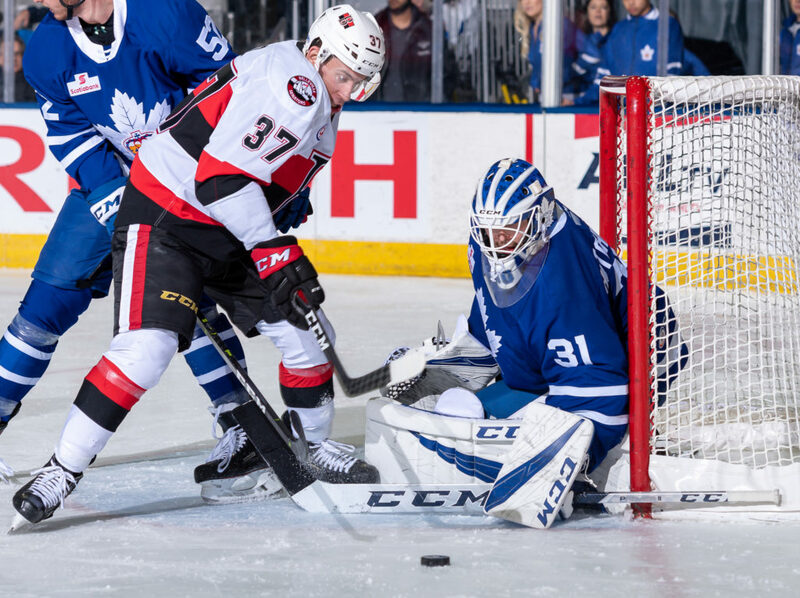 The Marlies and Senators met for the eighth time this season Tuesday night for a weekday clash at Coca-Cola Coliseum. The Senators came out firing as they looked to snap a three-game losing streak. The quick jump paid off as they opened the scoring just 1:18 into the first period. Erik Burgdoerfer notched the opening goal from Nick Paul and Drake Batherson. Jeremy Bracco got the Marlies on the board at 7:36, finishing off a beautiful pass from Chris Mueller to even the score 1-1. Calle Rosen picked up the secondary assist on the goal which was his 30th of the season. The Marlies took the lead at 12:58 when Trevor Moore found Sam Gagner in the slot and he made no mistake sending a wrist shot over the shoulder of Marcus Hogberg. The Senators were quick to respond as Jordan Murray beat Michael Hutchinson to even things up 2-2. Shots on goal in the opening frame were 12-7 in favour of the Marlies. The second period mirrored the first with goals going back-and-forth as each team looked to establish a lead. The Marlies took their second lead of the night at 10:26 when Jeremy Bracco sent Chris Mueller on a breakaway where he beat Hogberg to put the Marlies up 3-2. At 13:58 the Senators tied things back up with a goal from Nick Paul. Late in the frame Aaron Luchuk restored the Senators’ lead to make it 4-3. The Marlies responded 30 seconds later as Michael Carcone one-timed a pass from Colin Greening past Hogberg to knot the score 4-4. The back and forth trend carried into the third period as each team added a pair of goals in the final frame. The Senators added two goal, 20 seconds apart early in the third to jump up to a 6-4 lead. Not to be outdone, the Marlies responded with goals from Andreas Borgman and Frank Corrado to even the score and send things into overtime. As always, 3-on-3 sudden death overtime saw intense end to end action as both teams exchanged chances. The Senators capitalized in the final minute of extra time as Sam Gagner got tripped up in the offensive zone allowing the Senators to jump out on an odd-man rush and notch the game winner. The Marlies are back in action on Saturday to host the Springfield Thunderbirds for a 4:00 PM start at Coca-Cola Coliseum. Jeremy Bracco opened the scoring for Toronto at 7:36 of the first period and later added the lone assist on Mueller’s third period goal. This is the 12th game where Bracco has recorded two or more points (8-25-33). Bracco has scored 19 points (6 goals, 13 assists) at home. Sam Gagner scored Toronto’s second goal of the night at 12:58 of the first period and later added the primary assist on Borgman’s third period goal. Gagner has three points (2 goals, 1 assist) in two consecutive games. Chris Mueller scored at 10:26 of the third period and earlier recorded the primary assist on Bracco’s first period goal. Mueller is third in the AHL in points (22-32-47). Mueller has six points (3 goals, 3 assists) in his last four games. Michael Carcone scored at 18:30 of the second period. Carcone has nine points (6 goals, 3 assists) in 15 games with Toronto this season. Carcone led the Marlies in shots (7) in his first game since sustaining an injury on January 12. Andreas Borgman scored at 11:51 of the third period. Borgman has recorded 15 points (4 goals, 11 assists) in 34 games this season with the Marlies. Frank Corrado scored at 14:56 of the third period. Corrado has five points (2 goals, 3 assists) in 35 games with Toronto this season. Calle Rosen registered the secondary assists on Bracco’s first period goal and Carcone’s second period goal. Rosen has six assists in his last four games and is fourth overall in the AHL in assists (31). Trevor Moore picked up the lone assist on Gagner’s first period goal and the secondary assist on Borgman’s third period goal. Moore has five points (2 goals, 3 assists) in three consecutive games. This is his ninth multi-point game of the season. Colin Greening recorded the primary assist on Carcone’s second period goal. Adam Brooks collected the lone assist on Corrado’s third period goal. Brooks has 18 points (9 goals, 9 assists) in 34 games this season. Michael Hutchinson stopped 27 of 34 shots he faced. Hutchinson is now 6-3-3-1 on the season with a .897 Save Percentage and a 3.32 Goals Against Average. Toronto went 1-for-2 on the penalty kill and 0-for-2 on the power play. This is the first time in five game the Marlies have not recorded a power play goal. Toronto had a 44-34 edge in shots in all situations. Michael Carcone led the Marlies with seven shots on goal. The Marlies are 17-13-4-3 against North Division opponents and are 3-3-2-0 against the Senators. The Marlies are 5-3-1-0 when tied after the first period and 6-1-2-1 when tied after the second period. Toronto is 13-8-3-1 when outshooting their opponent. The Marlies are 1-1-1-0 in Tuesday games and are 2-0-1-0 in February. Sam Gagner has recorded points (2-1-3) in consecutive games. Trevor Moore has recorded points (1-4-5) in three consecutive games. Chris Mueller has recorded points (3-3-6) in four consecutive games. Calle Rosen has recorded assists (6) in four consecutive games. Timothy Liljegren (ankle) did not dress for today’s game. He is week-to-week with a high ankle sprain. Mason Marchment (collarbone) did not dress for today’s game. He left Toronto’s game in the first period on February 1 against Laval and did not return. Steve Oleksy (concussion) did not dress for today’s game. He left Toronto’s game on January 5 against Syracuse and did not return. Rasmus Sandin (elbow sprain) did not dress for today’s game following an injury sustained during the World Juniors. February 3: Traded defenceman Stefan LeBlanc to Utica (AHL) in exchange for forward Tanner MacMaster. February 3: Loaned defenceman Martin Marincin from Toronto (NHL). February 2: Recalled forward Griffen Molino from loan to Newfoundland (ECHL). January 28: Recalled forward Carl Grundstrom from loan by Toronto (NHL). I don’t say anything to them after a game like this but we’ll certainly talk tomorrow. It’s a major step backwards again for our team. I thought defensively we just played with no purpose at all throughout the game. You know we’re a high flying, free-wheeling offensively so we found a way to score a bunch which is good but we should win 100 per cent of the games that we score four goals, let alone six. So, we’ve got to be a whole lot better. We go through last weekend and don’t give up a goal through 120 minutes of hockey but today, played with no structure at all. It’s just showing that we’re not where we need to be as a team. So, we have another opportunity to reflect and practice tomorrow. I think you get embarrassed today. You get that top line of theirs that did whatever they wanted out there tonight. So, I think that’s pretty embarrassing for our team and it’s been that way most of the season. I shouldn’t have to say or at least I don’t think I’ll have to say too much. Our guys will come to the rink ready to work tomorrow. I think in a lot of ways he stood out in a positive way like he maybe he didn’t belong here in that sense but it’s nice to have him, for sure. You’d like to think we would have a better defensive display with him back there. But the thing I liked about it is he came into play with a lot of confidence offensively. You’re not really afforded those opportunities in the NHL game but it just shows his confidence that he has and the ability that he has at this level so it’s good to see him having fun out there. I think we’ll see Sandin (this weekend), I don’t think we’ll see Liljegren. We’re going to take a little more time with him. I wouldn’t rule it out but it’s not something that we’re scheduling at this point in terms of where he’s at. But he’s going to get a couple more practices and we’ll see where he goes. But Sandin at this stage is really close. So, we’re hopeful that he’ll be in, be ready. I think that’ll be the case. 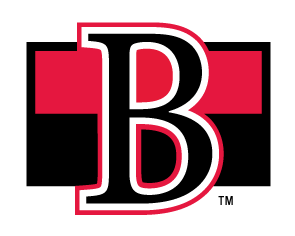 The Toronto Marlies (24-16-3-3) and Belleville Senators (20-23-2-3) meet tonight for their eighth meeting of the season and third meeting at Coca-Cola Coliseum. Coming into tonight’s game, the Senators will be looking to get back in the win column after dropping six of their previous 10 contests including consecutive shootout losses in their last three. On the flip side the Marlies seem to have hit their stride, picking up wins in their previous three games. They’ll be looking to even up the Battle of Ontario series and make it four-straight tonight. The Marlies currently sit third (54 points) in a tight North Division playoff race, while the Senators are eighth with 45 points. Players to watch: With four points in his last three games, Chris Mueller continues to lead the Marlies and sits fourth amongst AHL skaters with 45 points. After recording two assists on Saturday, Calle Rosen now has 29 assists on the season which tops all AHL defencemen. 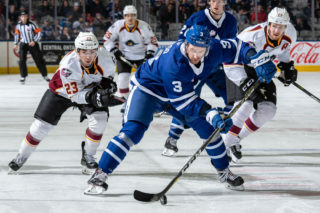 The Marlies will have a couple new faces in the lineup tonight with the addition of defenceman Martin Marincin, loaned from the Maple Leafs, and forward Tanner MacMaster, acquired via trade with Utica in exchange for Stefan LeBlanc. Puck drops at 7:00 PM on Leafs Nation Network and AHLTV. Fans can follow us on Twitter and Instagram for behind-the-scenes action from Coca-Cola Coliseum.